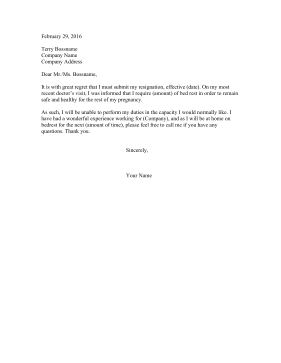 Perfect for a complicated pregnancy, this resignation letter is for an employee who's leaving to be on bed rest. It is with great regret that I must submit my resignation, effective (date). On my most recent doctor's visit, I was informed that I require (amount) of bed rest in order to remain safe and healthy for the rest of my pregnancy. As such, I will be unable to perform my duties in the capacity I would normally like. I have had a wonderful experience working for (Company), and as I will be at home on bedrest for the next (amount of time), please feel free to call me if you have any questions. Thank you.